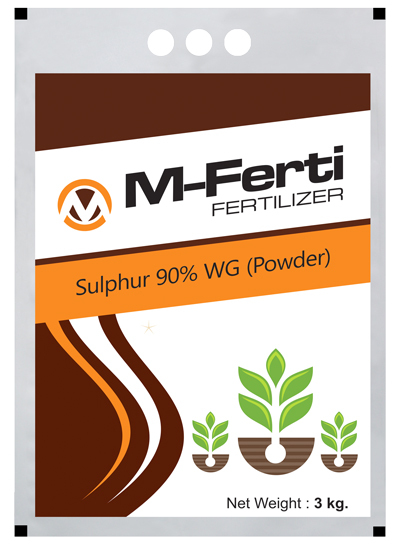 M-FERTI is a Sulphur based Fertilizer. It helps in improving pH of the alkaline soil & helps in better uptake of other nutrients. Sulphur is deficient in most Indian soils, so it helps in maintaining sulphur levels in the soil. Sulphur is also the key ingredient for photosynthesis, so it promotes photosynthesis & enhances quality & productivity of crops. It also increases shelf life of the produce. Dose : 3 kg per acre. It can be used with other fertilizers like NPK, DAP, Urea, etc. It can be used on all major crops such as Paddy, Wheat, Maize, Sugercane, Groundnut, Soyabean, Vegetables, Fruits & Fodder Crops.